ATHENS, December 6. /TASS/. Greece hopes Russia will make strategic investments in its infrastructure, ports, processing industries, agrarian and energy sectors, Greek Prime Minister Alexis Tsipras said in an interview with TASS First Deputy Director General Mikhail Gusman ahead of his visit to Moscow on December 7. Tsipras noted undeniable progress in relations between the two countries in the sphere of culture reached thanks to the cross Year of Greece in Russia and Russia in Greece. "These is progress in the sphere of economic and trade cooperation as well. We have had Russian investments in real estate, we have seen a major growth in tourist flows from Russia in the recent years. I hope the enjoyed their stay in Greece," he said. In his words, "there are important possibilities for strategic investments" in country, especially now that Greece is through with a difficult economic situation of previous years. "There are beneficial possibilities for strategic investments in infrastructure, ports, processing industries, the agrarian and food sectors, and especially in the energy sector" as Greece wants to be an energy and transit hub in the region, he said. 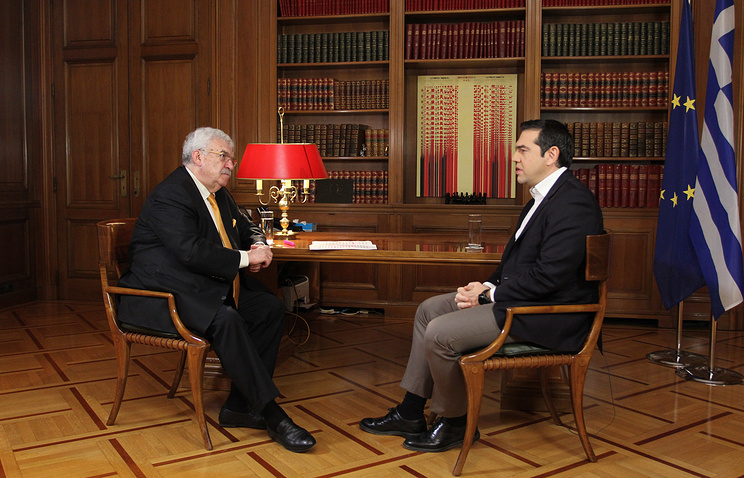 "I think it will be in focus of talks with President [of Russia Vladimir] Putin during my visit to Moscow," Tsipras stressed. The Greek prime minister will pay a visit to Moscow on December 7 at the invitation of Russian President Vladimir Putin. The program of the visit also includes talks with Russian Prime Minister Dmitry Medvedev. The visit is expected to yield a package of documents.